A really cool version of California Coffeeberry which is also native to SW Oregon. 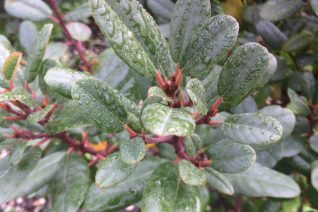 Thick deep green rounded leaves cloth madder red stems densely on this large shrub that can achieve tree like status with time. Insignificant green flowers transform into brown then black berries eaten by wildlife. Incredibly drought adapted never needing ANY supplemental water. Well drained soils in full sun. To 9′ x 9′ in 8 years. Pruning can keep it lower and it would make an admirable hedge. Cold hardy.